The health benefits of Basil Leaves are much more than this article includes. Use of Basil Leaves support healthy brain, manages arthritis and stress which is the common problem of today’s world. It also includes slowing down the aging process of us. It has command over Epilepsy, Metabolism, preventing Cancer, the most dangerous disease in the world. Other benefits that the Basil Leaves may provide us are- diminishing post menstrual syndrome, assisting the health of our eyes. It also provides us energy to be active all the time in this busy world. I have mentioned too much health benefits of Basil Leaves but you may think what these Basil Leaves are. Your answer is here. Basil is a kind of small herbal tree belonging to the sage family. Its botanical name is Ocimum Basilium. There are many books claim that the Basil has its origin in the Hunan Region of China. They also claim that the herb has been cultivated for more than 5000 years in China. The people around the world can get its benefits easily because they can grow it in their houses. Basil is one of the most useful herbs that do not require too much sunlight to grow. So, you also can take its benefits by growing it in your house. If you go through the history of Basil, you will find many interesting facts relating to Basil Leaves and its benefits. The ancient people had the thought that Basil Leaves could supply power to strengthen people while they were in fasting. They also thought that the Basil Leaves had a magical power to cure diseases. And it is true in the modern world also. In ancient Egypt, the basil was used for mummification which was a process for keeping the dead body intact for several years. People of Greeks obey the basil as the symbol of mourning. People of India believed the Basil as the protector of Poor and afterlife. Ancient people also used this herb to ward off the devil in the women body or mind for which the affected woman got various symptoms. However, some doctor of that day had their belief that Basil Leaves was poisonous. Most probably it was introduced in the western world in the 16th century. There was also a myth that if Basil plant is kept in between the two bricks, it would get its life to be a scorpion. We all know that Greece is a mythological land and also well acquainted for its mythological creatures or animals. There was a creature named Basilisk having dragon-like look. The then people of Greece believed that if this creature bites a person, the medicines of that bite was believed to be only the Basil. The Basil or Tulsi is known to be the Royal plant even now for its magical power. It is a very sacred herb among the Hindu of the world. Without Basil Leaves no worshipping is completed. The Hindu believed it to the Goddesses of Laxmi, the Goddesses of Wealth. All the Hindu of the world plants the Basil in their houses for keeping peace in their family and also to get rid of the evil spirit. To sum up, its nutritional value is beyond our imagination. It is full of nutrients. The ingredients exist in the Basil or its leaves have the power to fight against many diseases. Taking Basil Leaves improves our immunity power also. Five or Six Basil Leaves with one teaspoonful of pure honey for five days can eliminate a cough easily. The research is going on till now on the Basil or Tulsi. 1. Healthy Brain: - Memory loss is one of the biggest problems for older people of today. However, studies show that the Basil Leaves have the ability to decrease such conditions of older people. Basil is a powerful source of minerals like manganese which has the capability of increasing electrical transmission in our brain. This kind of activity in our brain is necessary for mental reflection. The copper present in the Basil or Basil Leaves vitalize our mind and intensify the functionality of our brain. 2. Management of Arthritis: - many of us are well acquainted with Arthritis, a dangerous painful disease. The patient of Arthritis may sometimes go to physical disabilities for its unbearable pain. It is observed that Basil or the Basil Leaves hold beta-caryophyllene which can help to manage pain. Basil also contains a kind of chemical that has the power to control inflammation caused by Arthritis. It can also decrease the burning sensation in the patient’s joints caused by Arthritis. An experiment on rats revealed that the use of Basil in their diet makes them free from Arthritis. 3. Basil and Stress Management: - Stress that may be emotional or physical is common to all the living people of the world today. Adaptogens are very useful to maintain our stress. Basil or Basil Leaves contains such ingredient that can help us to decrease our stress. Taking Basil Leaves may make us stress-free even when we are going under heavy stressful events. Basil has the capability to reduce the hormone levels in our health and also lower down the level of Corticosterone in our body. So, consumption of Holy Basil Leaves is very helpful to all of us. 4. Reduction of Ageing: - The basic thing of a person for feeling and looking old is for their skin and brain. It plays an ignoble role in our mind that we are growing old. Everybody fears to be looking old. The basil Leaves have the power to reduce our aging process. It contains antioxidants which help us to maintain both our skin and brain from this radical effect. So, consume Basil Leaves regularly to make yourself young and stress-free. 5. Making Strong Bones: - Strong bones are very necessary for us to keep our body stable and fit. But after the age of 40 or 45 years, our bone density decreases gradually. For this, we have to face many bone-related diseases for fragile bone. The women are more affected than men due to Osteoporosis. To prevent such conditions we need Vitamin K. This herb is a powerful source of Vitamin K which helps us maintaining strong bones. We all know that calcium is the main ingredient of our bone. Vitamin K assists our bone to absorb calcium better. 6. Managing Epilepsy: - Extract of Basil Leaves can lower down the spasmodic activity in our brain. Eugenol present in the Basil Leaves is very beneficial for our nervous system. An experiment on animal revealed that fact. So, taking this herb can manage Epilepsy. 7. Helps Metabolism: - We need a good metabolic rate to keep our body slim and healthy. Manganese is very helpful for releasing enzymes. It can metabolize amino acid, cholesterol, and carbohydrates. It also improves the metabolic rate of some vitamins that are related to maintaining sugar level in our blood. Basil is a storehouse of manganese that can help the above-mentioned facts of our body. 8. Post Menstrual Syndrome: - It is a highly painful time for women. At least 75% of women have to undergo such a situation. The syndrome the women feel at that time are- cramps, depression, and fatigue. Basil that contains manganese can relief those women by stabilizing the release of hormones. It lowers down the stress and fatigue at that time. 9. Energy Source: - We need the energy to keep us active, healthy and stress-free. Adenosine Tri-Phosphate is a compound which helps us reducing fatigue and extra exhaustion in our body. 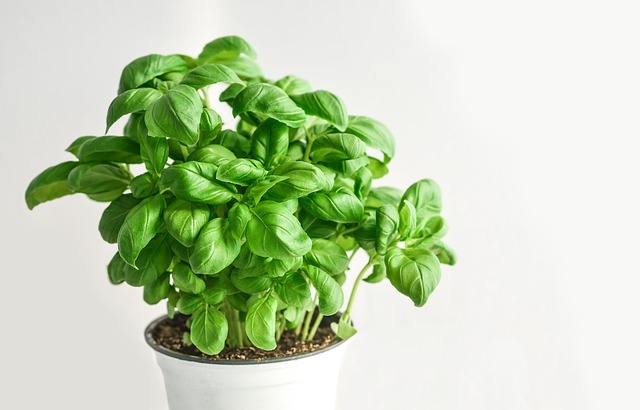 In this regard copper, a kind of metal, present in the Basil produces Adenosine Tri-Phosphate and helps us to keep our energy level high and stress-free. So, take this leaf to keep our body active, healthy and stress-free. 10. Anti Microbial: - The herb works as anti-microbial as it contains some kind of compounds which have unstable in nature. Eugenol is one of them. It helps us by decreasing the possibility of fungal and bacterial attacks. Taking this herb you can minimize your possibility of getting attacked from such bacteria and fungi. 11. Prevention for Cancer: - The herb has the power to prevent cancer cell formation in our body as it contains many powerful antioxidants like Phenolics and Anthocyanins. These two elements secure and protect our body from reactive oxygen species. According to the researchers, these are one of the main sources of cancer cell formation. 12. Healthy and Sound Eyes: - Basil is a powerful source of Vitamin A. This Vitamin A helps our eyes good and disease free. It also helps us by preventing muscle degeneration with the help of beta-carotene which is one the main ingredients the Basil Leaves contains. goos article on baail leaves. it will help ua to prevent many diseases. thank you for publishing auxh article. I appreciate your work. Very very good article on Basil Leaves.It will help us in many ways for elemeneting many disease. Such as cough and so on. Your coment is very precious as you are a pharmacists.